Today's card was CASEd from Roseanne Mulhern. I LOVE this layout. I'm not sure how she made hers, so I had to just make up my own way. I used a 5-1/4" x 4" piece of Painted Harvest Designer Series Paper to place my elements. I cut off the top 1-1/4", then cut the larger, bottom piece using the scallop piece from the Seasonal Layers Thinlits. I turned the middle piece around, so it contrasts with the rest of the piece. Any of the straight edges can be trimmed to make the cut pieces fit onto the card nicely. Then the element which has the sentiment from Paisleys and Posies was cut using the Stitched Shapes Framelits, Layering Ovals Framelits. My colors are Very Vanilla, Pumpkin Pie and Early Espresso. Aren't those tiny little acorns cute? They were fussy cut by hand and then popped up with dimensionals. I used a glue dot to adhere the Linen Thread bow. Thank you for looking at my card today. 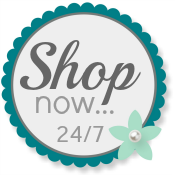 Please use my Online Store any time! Absolutely beautiful, Patti! I LOVE all of the layers. Gorgeous fall colors!